You are currently browsing the category archive for the ‘General Bonsai’ category. Last post for a while. For the next 4 or 5 weeks I will be in Japan so will most probably not have the opportunity to post on the blog as much as I would like during that time. My trees are going off to be baby sat this weekend as we make our final plans. Although the trip is family based I am going to make sure I squeeze a few bonsai stops in along the way and hopefully also make it to the Gafu-ten show in Kyoto as well as a handful of nurseries. In the mean time, I will leave you with a display I made with the talented Mario Komsta when I was studying at Taisho-en. We were talking about display and quickly grabbed some small items that were at hand that were in scale with this tiny black pine. We played around with various arrangements and stands to test a few different ideas. This was the final arrangement. We jokingly called it ‘3 points of our lives’ as most of the days we spent working together on bonsai, we talked about girls, cars and Mario’s favorite topic, motorbikes. 3 points of interest? convenience store toy car, hand-made news paper pop star girl scroll and beautiful mini black pine. When I get back from Japan I should have a whole heap of photos to share. 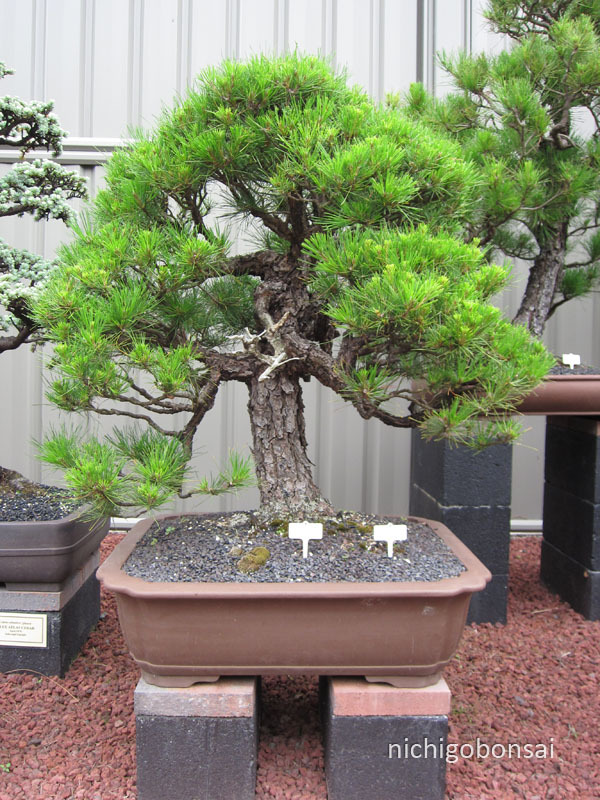 Amongst the display trees that I saw at collectors corner (which can be seen HERE and HERE) I noticed that a large percentage of the display trees were Pinus Radiata. In fact the first tree that greets you once you enter the nursery is a big old Radiata. 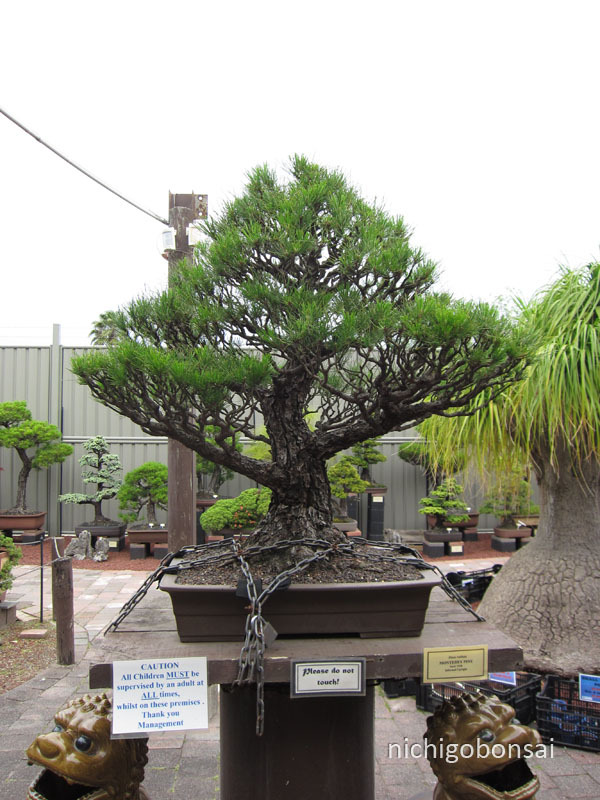 This tree has been in possession of the nursery for a number of years and has always been an impressive bonsai. So impressive it seems it needs to be chained down! 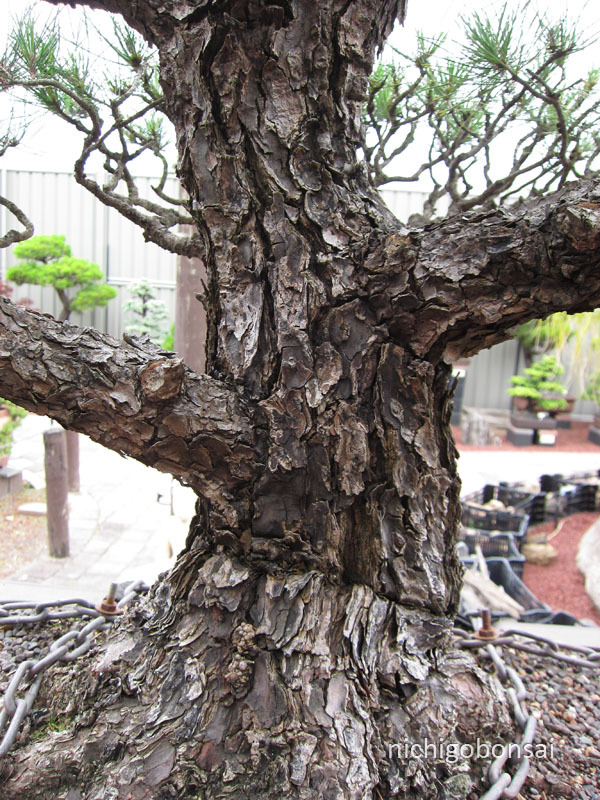 The old bark that the tree exhibits is beautiful and the crackled plates of bark seem in a good scale with the rest of the bonsai. Now why does this tree have a post of its own? 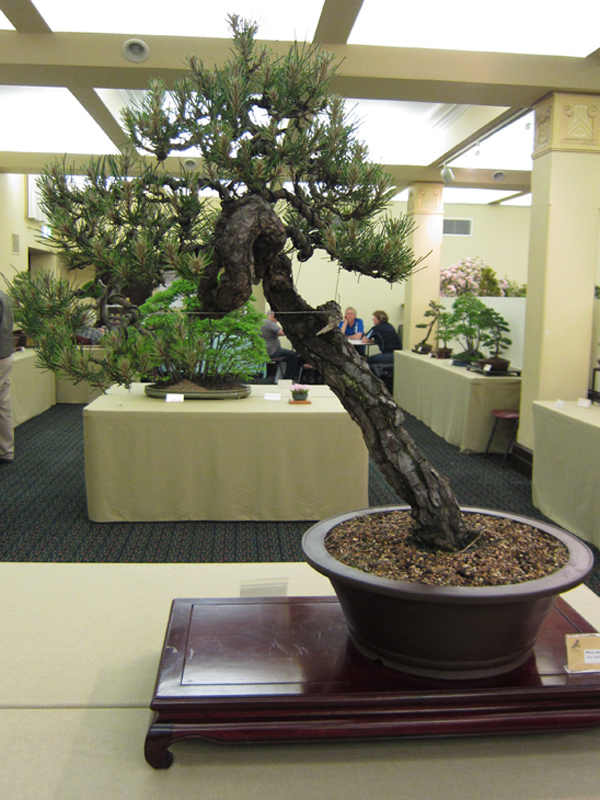 Well I thought that this bonsai was a good example of some of the problems that these old radiatas face. From a distance the tree seems to be full of foliage but upon closer inspection a different story is told. As you can see from the above image the foliage is only on the tips of long leggy branches. This is a problem. The tree has no inner buds and no fine inner branches to cut back to. What this means is that the outline of the tree can never be reduced without the aid of grafting as at least from what i have found and the experiences of other local growers with the species, Radiata’s dont bud onto old wood well. What does this mean for this tree? Well I think it needs a major re-working. It is always nice to project the future onto trees so I will have a quick go at making a list of the things I think needs doing short of feeding aggressively, watering etc. The branches have all grown upward. The first port of call would be to correct this by doing some heavy bending on each of the main branches, bending them down to just below horizontal. Wire all the sub branches and prune growth back where possible. This would have a two-fold effect. Bringing the foliage down would allow for light to get into the inner areas of the tree as well as taking the dominance out of the tips. A tip that is pointed upwards will always grow strongly from the tip. If it is horizontal it is more likely to bud along its length. Feed feed feed. 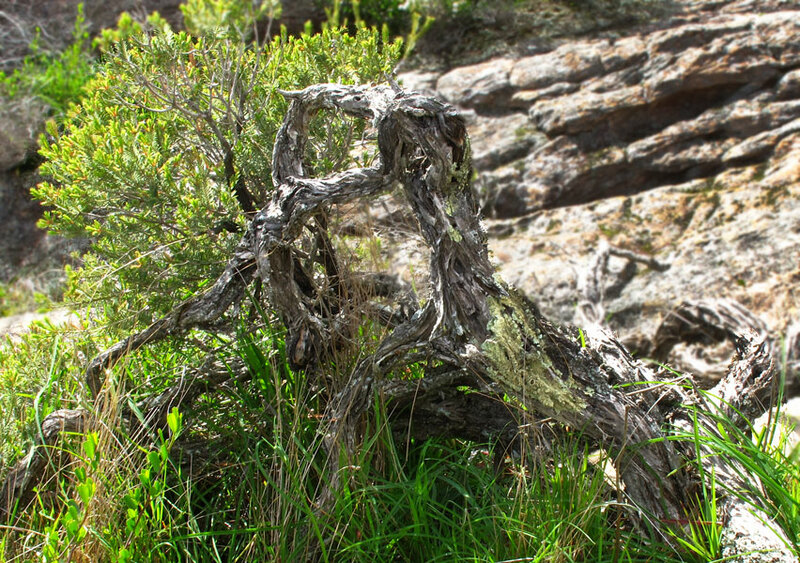 If you are to hope of getting budding on old wood you will need a healthy, strongly growing bonsai. 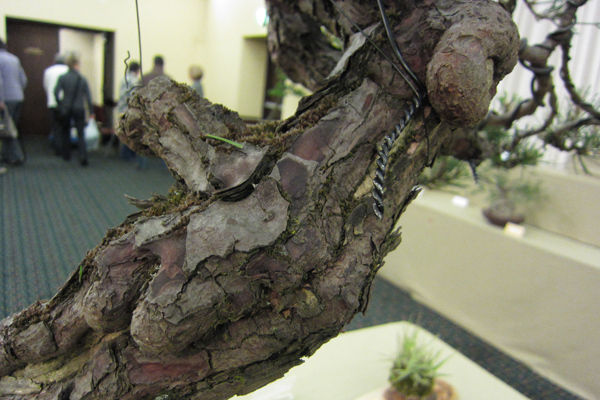 I would then look at grafting opportunities to start re-introducing growth into inner areas of the branch structure. I think with a work routine something like the above the tree could be vastly improved. A nice tree as it is (Age tends to excuse many faults) but I think it could be better. If it were ever to come up for sale I am sure I could find room for it at my place. After seeing this tree I began to think if these problems are some that I might be facing with my Radiatas in the future. Hopefully through regular styling I can avoid the upward branch problems but I am a little concerned about the lack of back budding. Hopefully one day I will unlock the key to this dilemma. Perhaps in this case it is a result of a thick canopy shading out inner growth?I think the above tree had just been heavily thinned as my memory of it in previous visits was of a much denser canopy. Either way, in the mean time I will keep on experimenting with my trees and keep dreaming about other people’s trees that I would love to own. 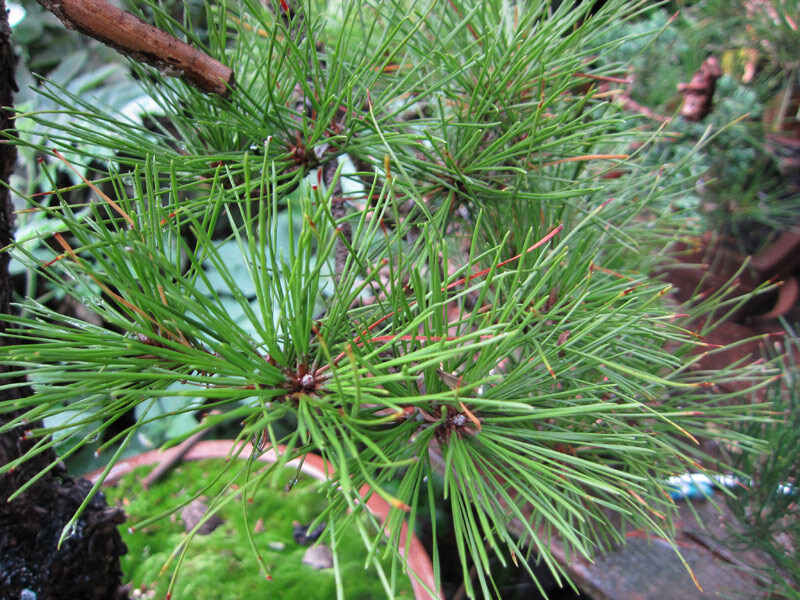 One such tree that caught my eye at the nursery was the pine below. Again another Radiata. I keep finding myself being drawn to trees with problems. I think I enjoy both looking at these bonsai that challenge the rigid frameworks some people use and also love to work on them to try to use those awkward features to form a design that works in a classical sense. The heart of the problem or the heart of the opportunity? Again I think the age displayed by this tree excuses a lot of the faults and in a way the faults in branch placement almost add to the ancient feeling the tree exhibits. Would I change things? Most probably yes, but I would like to live with the tree for a long while first to get to know each of its quirks. Again I think with some creative styling and a total wiring this could become a very interesting tree. Another I could easily make room for at home. It is interesting to note that this tree also seems full of foliage from a far but on closer inspection it is actually quite leggy and bare on the interior. Now I am not sure if this is a result of age or whether this is due to too thick a canopy being kept that has shaded the interior, killing the inner shoots. Hopefully it was a lack of light and not just the result of the species growth habits. If it is just a lack of light I can rectify this on my own trees. Well i hope you have enjoyed these trees as much as I did. I always like to see old radiatas. I like to look into them and see if they will give away any hints that may lead to a future technique or method for getting them to back bud on old wood. Perhaps I will never find it, but I will definitely enjoy looking for it. On that note, does any one out there have old radiata or Monterey pines? How do you grow them? have they ended up leggy? I would love to hear from you. Please comment below or email me at the address on the left of my website. 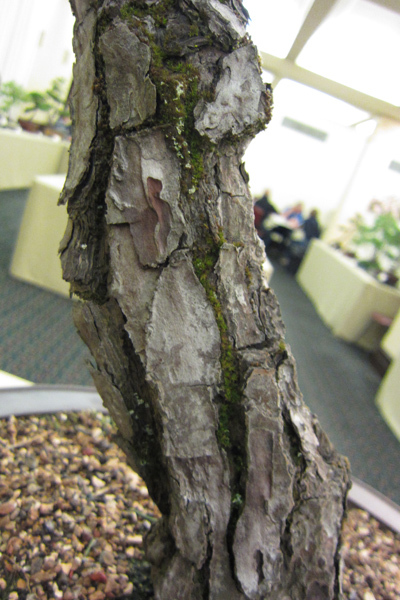 While at a local show one tree caught my eye. It was a Maritime Pine or Pinus pinaster. 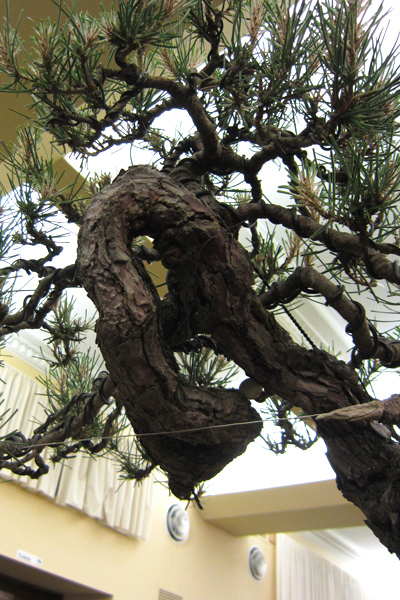 It had great movement and some really interesting features that made it great bonsai material. We don’t see a whole lot of maritime pines in Australia but after spending my time looking over this tree I think I would like to find one for my own collection. The bark was fantastic and old and had deep cracks through the red/orange coloured plates which was very similar to the bark on some collected trees I had seen in Japan. This really gave it the appearance of a very old tree. 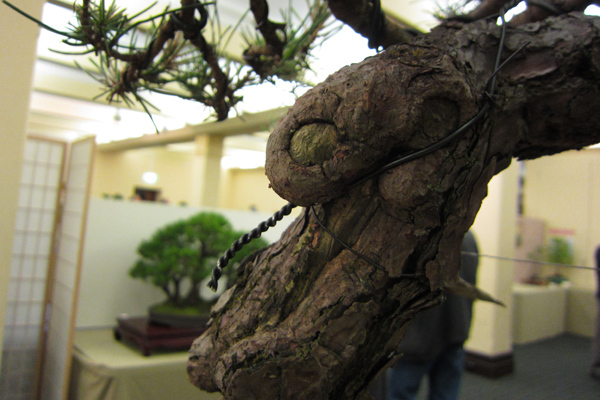 The tree also had very interesting movement in the upper sections of the bonsai. You can start to see the red colour in the bark. What was really interesting about this tree was around the back of the trunk where there was an old shari. Around the edge of the shari some strange blobs had formed which almost looked like fingers or melting candle wax. A thumb with finger nail perhaps? The thumb above with some more fingers growing further down the trunk. The one factor letting down this species would probably be the needles. They are very course and quite long. 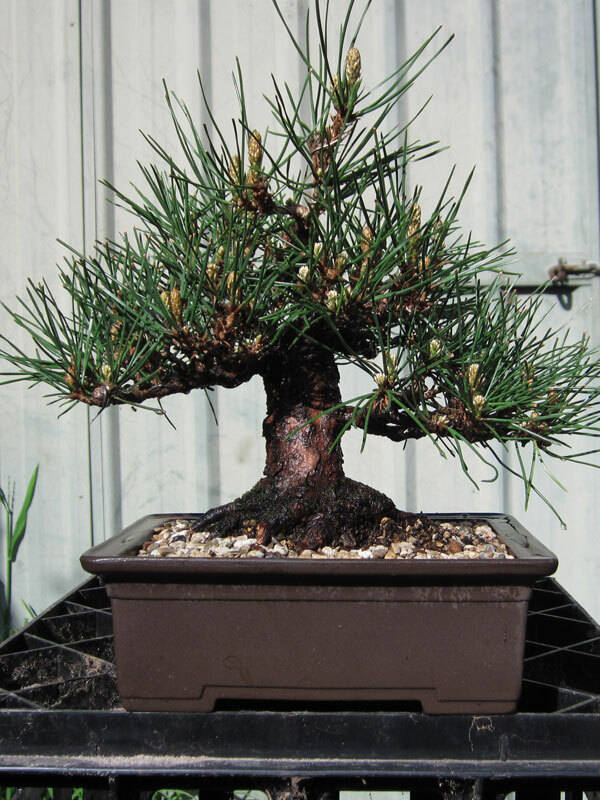 These long course needles had me thinking of images of what a tree like this could look like after a few years grafting either Japanese black, or Japanese Red Pine foliage onto the fantastic trunk and base. The whole tree complete with difficult to photograph background. A nice tree I would love to have on my bench. It is an interesting species I will be keeping an eye out for one in the future. Is anyone growing this species? I would love to hear about it and or any species specific techniques you use. Sold. 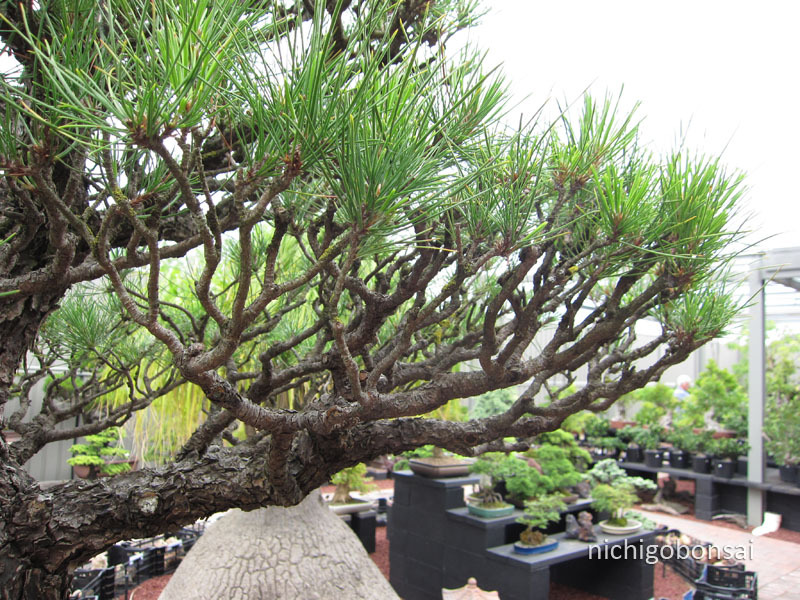 Japanese black pine shohin. Last night I sold the above pine. I had been torn as to whether or not to sell this tree for about a year. Small black pines are hard to come by in Australia. This morning when I went out to water and it was confirmed that it was a good decision. I moved my trees a little to fill in the space it had left and I didn’t miss it at all. In fact of all the trees I have sold I have never missed one. Now this is not because they were not good trees. Each one had been grown because it had good qualities or good potential, but for what ever reason they had stopped speaking to me. In this case it was a casuality of trying to cut down my collection a little so I can dedicate more time to refining each of my remaining trees. I have also sold trees that I had sentimental attachment to aswell. I sold the first tree I grew a number of years ago. It was not a particularly good tree but for what ever reason I felt attached to it as it had been my first bonsai. It was a difficult decision to sell it but once it had sold I didn’t ever regret it or really even think of it again. Which I guess brings me to my point, sometimes one of the best ways to improve your collection is to sell those trees that either have lesser promise in your collection or those that you are no longer enthusiastic about working up to a higher level. Once sold i am sure you will not regret it or even think twice about the decision. 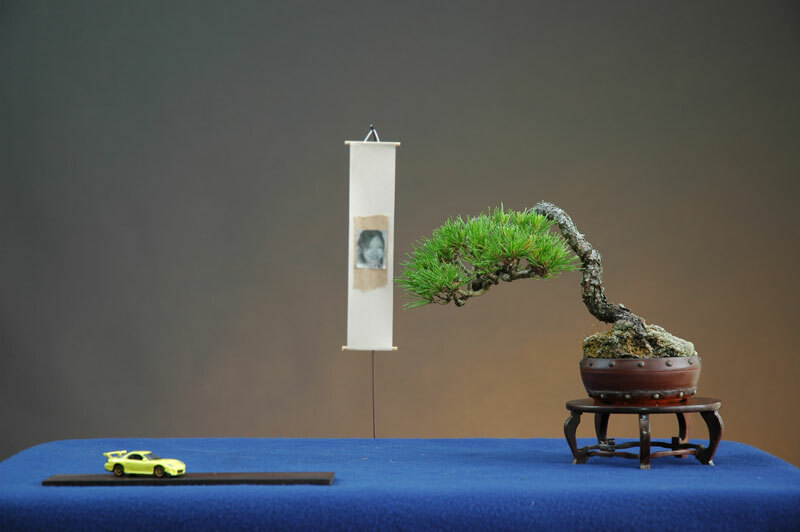 Not only will you be left with a better average level of bonsai in your collection but you may also be able to spend the sales proceeds on better bonsai or stock. I have a pretty busy week ahead so I though I would just post a quick picture of a tree a came across a few weekends ago growing in a national park. Its form reminded me of many of the collected Junipers you see from overseas. Enjoy. Luckily collecting is banned in national parks so people will be able to enjoy this trees form in its natural location. Just a few pics from around the garden. Spring has come early this year and nearly all my trees are starting to move. It’s an exciting time of year. A trident begins to leaf out. 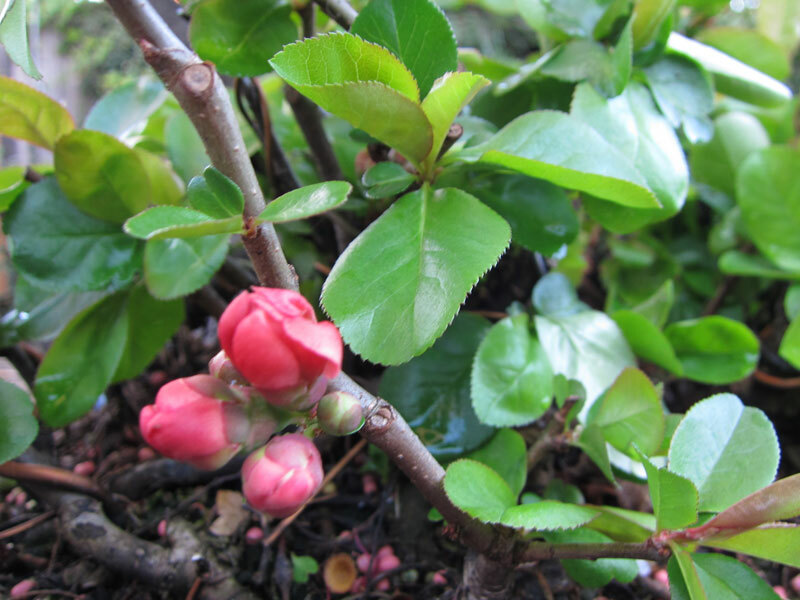 Flower buds swell on a flowering quince. 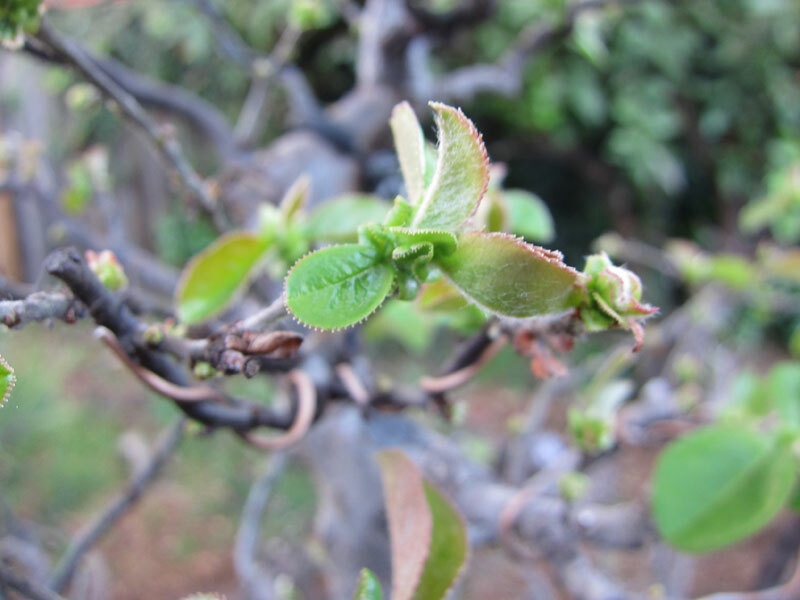 A Chinese quince almost fully in leaf. 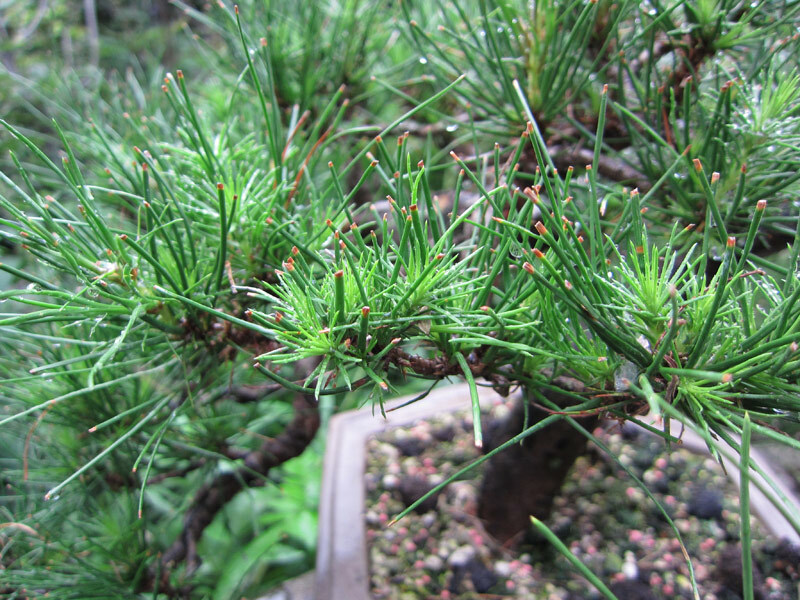 A shohin Red pine's candles begin to extend. I finally got around to purchasing a domain for this blog. You can now find the blog much more easily. If you have a bookmark or link to the old address, dont worry, you can still use it as both domains will direct you to this site. 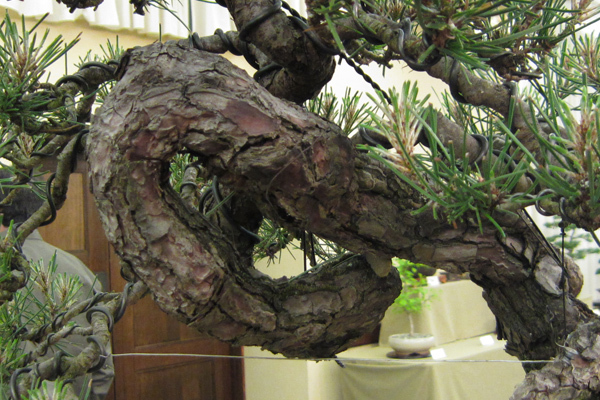 Pinus Radiata (Monterey Pine) Techniques 2. If you read my previous post Pinus Radiata (Monterey Pine) Techniques you are probably wondering how the progress is going. The answer is slowly but surely. After asking all over the net, i have come to the conclusion that not a whole lot is known about growing this species as bonsai. Funnily enough the most information came from Australians. 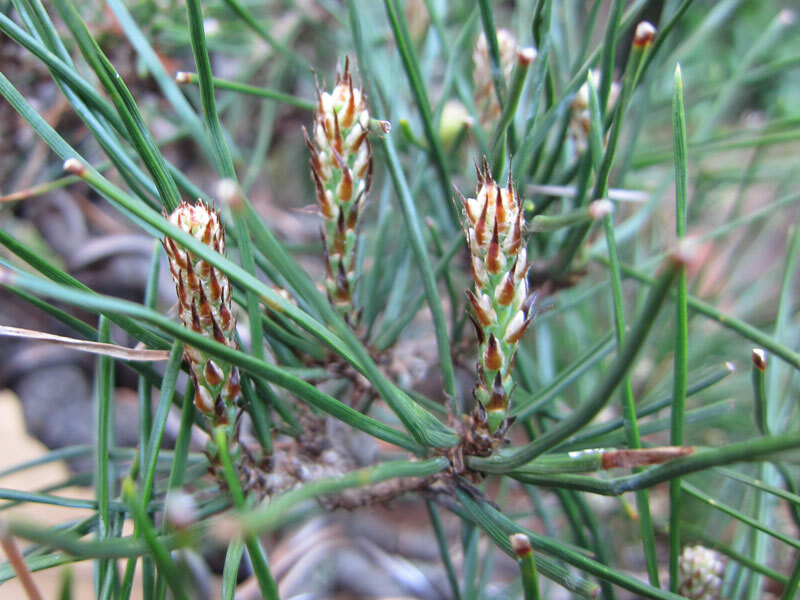 I am guessing that this is due to its wide availability in Australia and Australia’s lack of other dig-able pine species. There are quite a few growers of this species here and quite a healthy debate was started on Ausbonsai and some very nice examples of Raditatas grown as bonsai were posted. There was also a lot of interesting information shared such as how easily they airlayered. What has come out of this? Well I think it will be a bit of an ongoing project, ticking away in the background. I plan to document over the next 12 months the various changes in a couple of my trees as they grow in the hope that once I understand their growth habits a bit better I will be able to work out a timing for pruning and candle removal. I will keep giving updates from time to time as I document them. I will leave you with two images. Both images were taken on the same day, from different trees. One needed repotting and the other had been repotted this year. I think it is clear that one has neat needles while the other does not. This pair of images gives me hope i can get radiatas to consistently give short neat needles like those in the picture of the older tree. I am back from a hectic 3 weeks in Japan. Most of the other times i have been to Japan i have gone with the intention of cramming in as many bonsai related things as i could. This time was a little different. I went to Japan this time to get married. So needless to say, i had far less time to do bonsai things. That being said i did manage to fit some in. 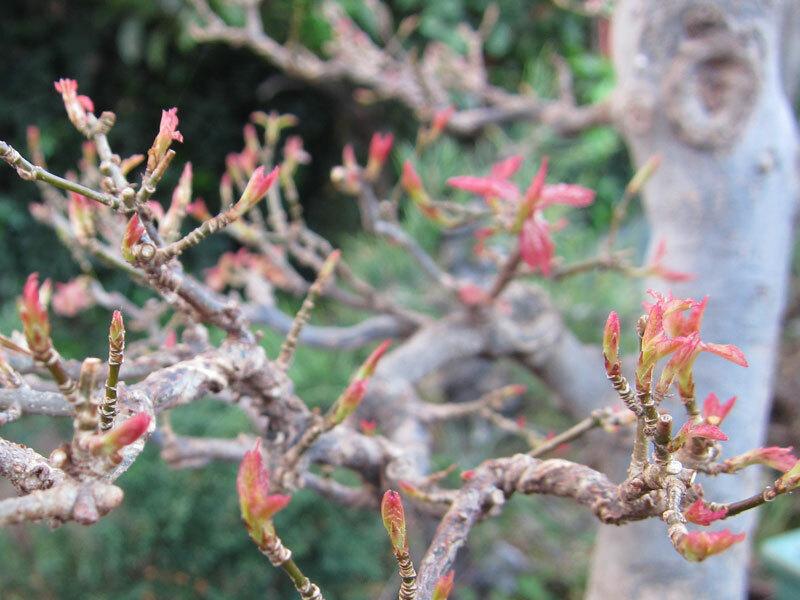 I visited a few nurseries, the new Omiya bonsai museum and the Gafu-ten exhibition. 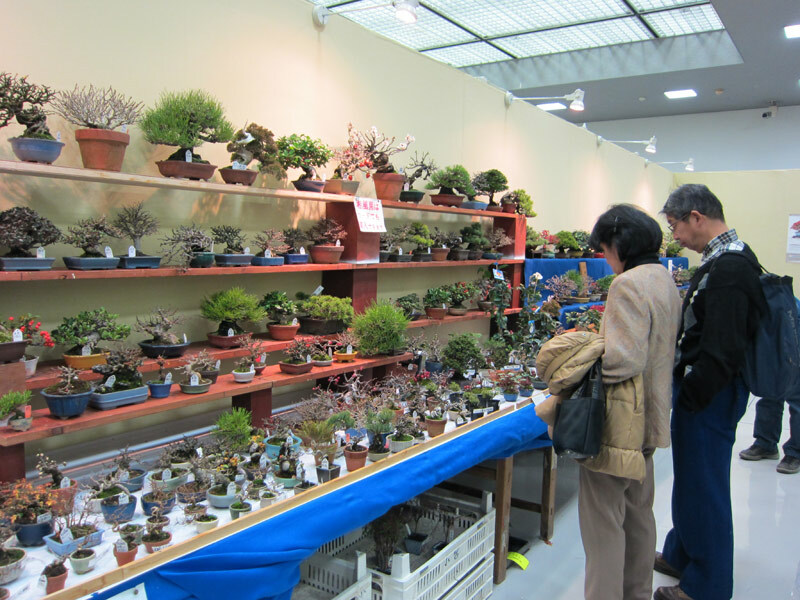 It was getting close to the selection time for Kokufu-ten so most nurseries had there submissions out being prepared. I would have liked to come home with a suitcase full of pots, but it was instead full of suits, shoes and my wife’s things (as she is relocating to Australia). I did fit a few things in though, including some Bunzan and Juko pots as well as some tools and a stone that caught my eye. I was also very lucky to be given a very old pot in a kiri box. Hopefully some of the things i brought back will become the topics of future posts. In the meantime while i sift through my pictures here is one from the sales area of Gafu-ten of to wet your appetites. Hopefully by the end of the week i will have found time to make a full Gafu-ten post. I am about to leave for Japan. My trees are being baby-sat and my camera is charged. I don’t know how often I will be able to post while away, but even though this trip is not totally bonsai related I should have a whole lot of images to add to this blog and my bonsai in Japan blog when i return. I will leave you with a picture I took last trip on the island of Miyajima. 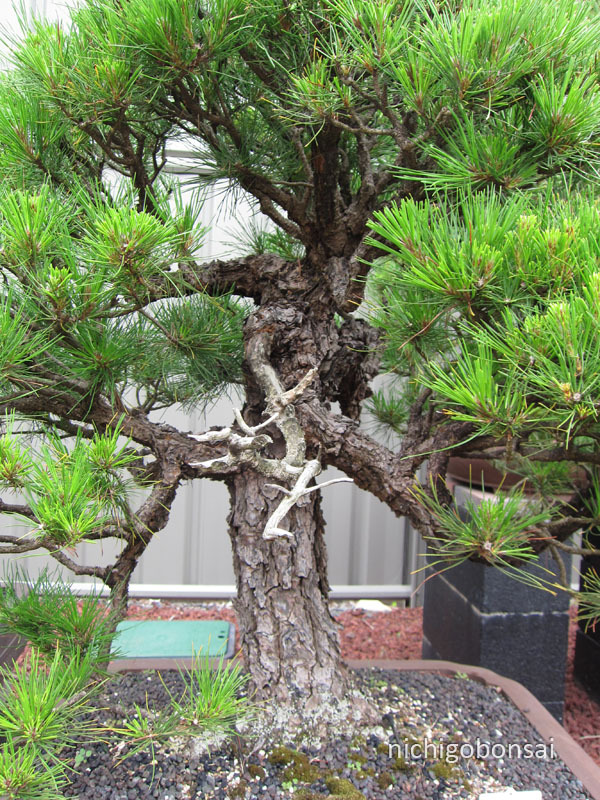 A red pine growing in what could only be described as the bunjin style. 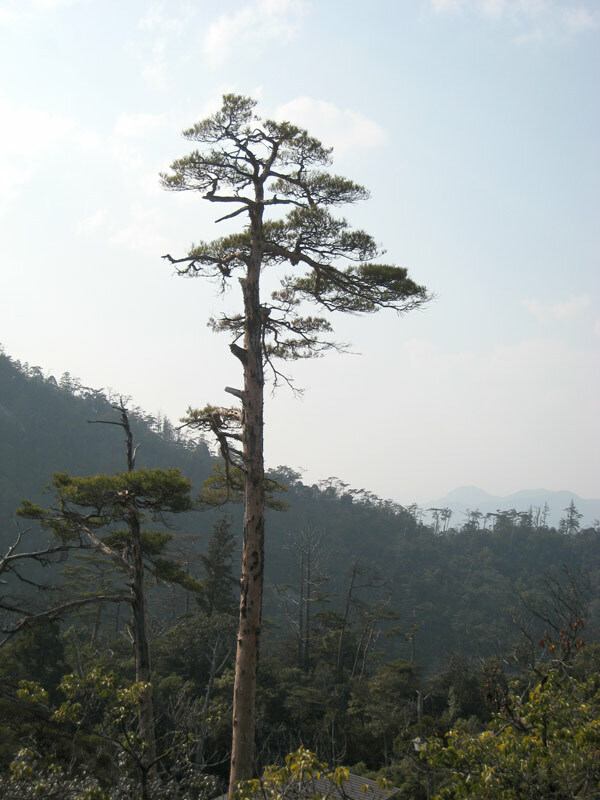 A red pine growing on top of Mt Misen, Miyajima. Merry Christmas everyone and see you all sometime in the New year.